Hello ladies, gentlemen and any single-celled organisms that may be reading this! I hope everyone's weeks were more splendid than the thought of a bunny on a unicycle! It took me an inordinate amount of time this week to figure out something to write about. Why? Mostly because every time I sat down to type my mind would be whisked away in a million different directions. I have ADHD. 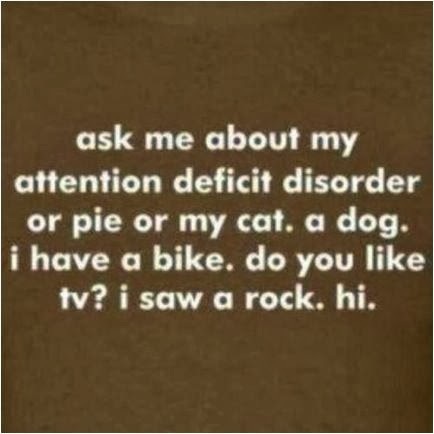 No, I'm not one of those people who says, "I'm so easily distracted, I must have ADHD!" Let me, quickly, dispel a couple of myths about ADHD for you. 1. ADHD is a made up diagnosis invented for people who can't control their children or own behaviors. False. It is actually an issue with the physical matter of the brain. Without using all the giant words that I learned to get my degree in psychology, basically ADHD means that one part of a person's brain is not communicating effectively or more slowly than the rest. Our brains, being the wonderful machines that they are, try to compensate by speeding everything up, but all that really does is create more of an imbalance. 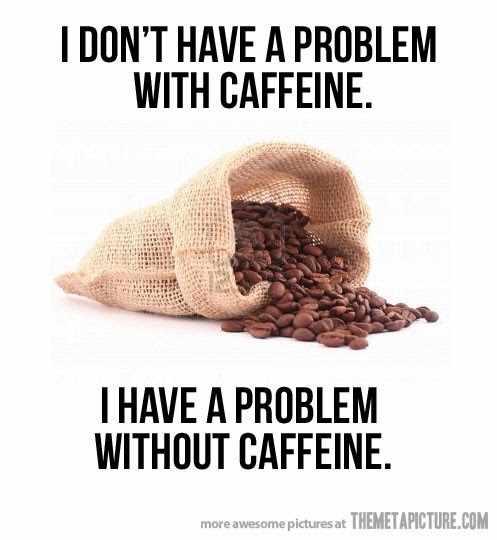 This is why stimulants, like caffeine, help. The stimulants help along the part of the brain that is not firing quite right to even things out. 2. If you have ADHD, you should be medicated. False. That's a little bit like saying that because the fourth Blade movie was terrible, the previous three were awful too. This is untrue, the fourth movie was a travesty, sure, but the previous three have made many a nerd's life just a little happier. You can't just arbitrarily group people together by diagnosis. I have several friends with ADHD that truly do need the medication that they take to focus. I am lucky to have a rather mild form of ADHD that I can mostly self-medicate with coffee and exercise. Some people need meds, others do not. It's that simple. 3. ADHD means that you're just super fidgety, right? False. Due to our lovely little neurotransmitters not firing the way they are supposed to, it means that we can be fidgety (I have a tendency to take apart any pen that's in my hands), but mostly it means we have issues being able to focus on a single task. Imagine that you have your computer browser open, and have 1,000 tabs open at once. Your computer, at random, switches tabs about every 10 or so seconds. That is basically what your brain on ADHD feels like. OK, I need to focus and write this post. At what point does bread officially become toast? I wonder if someone answered that on Google. I bet someone did, everything's on Google. Did I remember to lock my door? Maybe I should write a blog post about gerbil dreams! 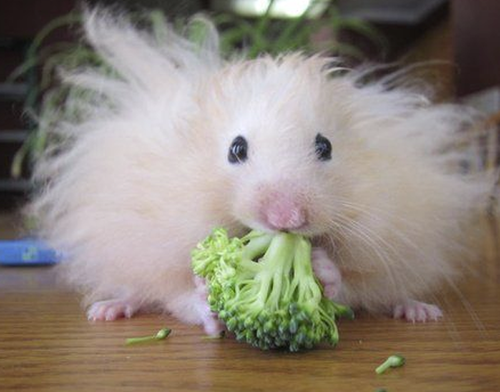 Wait, aren't gerbils the ones who eat their own young, or was that mice? I wonder if my friend's pet snake is over it's cold. I really should make some coffee. Gets up to make coffee. Returns five minutes later with no coffee, but has washed the dishes in her sink. Now, to write this blog post. Why do I feel like I'm forgetting something? Crud, I think I need to laundry again. Did I do laundry this week already? Oh, and I have to remember to send that e-mail at work on Monday. I wonder what the coffee special will be on Monday at that one espresso stand. Right, I was going to make coffee! I wonder if they will have that red-velvet latte this week? That was tasty! Goes to make coffee. Successfully starts coffee maker, then picks up a random book from the bookshelf, reads three pages, sets it down, before wandering back to the computer. Sits down, stares at toes. Why aren't toes just called mini-fingers? I guess toes is easier to say. Unlike the word "discombobulated," which really describes what it does to the human tongue. I wonder how one says "toes" in German? I'd love to learn how to speak German. After all, a lot of English has Germanic roots. Twenty minutes later I will finally remember that I made coffee and go get some. 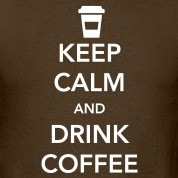 With caffeine stimulating my brain, and another hour or two, I will have a blog post. It is unlikely that I will ever figure out when bread officially becomes toast. 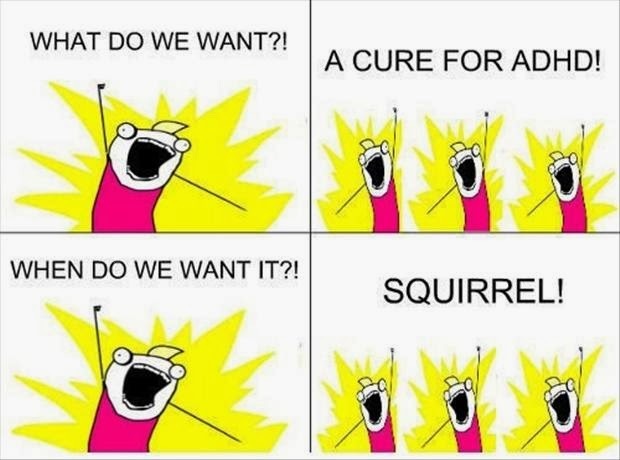 And that, folks, is what living with ADHD is like. 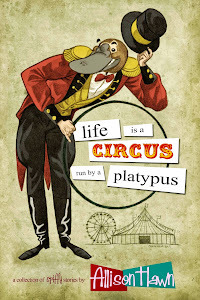 Does that help explain parts of "Life is a Circus Run by a Platypus" for anyone? Don't forget to check out my randomness on Facebook, Twitter and Goodreads! Love your blog and your approach. You have an incredibly easy to read style of writing. Thank you! Glad you enjoyed my ramblings.